Unplanned stresses also occur in pedestrian zones! Even single stresses, for example by means of heavy loads, could cause serious damage. More information. In particularly difficult circumstances, we use our versatile „Verschi vario +“ as a means to avoid displacements. Sustainability plays an important role in road construction! Damage caused by thrust, shear and torsion forces without built-in shifting prevention device. Our company based in Hamburg originated from the previous company Nupfahl GmbH & Co. KG and was renamed Nupfahl GmbH in 2011. Since 2005, we have been dealing with the problem of displacement of large-format slabs or paving made of concrete and natural stone. For this purpose, we have developed the “Verschi 485” and “Verschi vario +” shifting prevention devices. Traffic loads in inner city traffic areas, such as pedestrian zones, urban areas and other representative design areas are constantly on the rise. For these surfaces, frequently large-format paving and slabs are used as surfacing material. In this area of application, heavy-duty vehicles are used to access the selected areas. This results in strains caused by driving on curves, by braking and accelerating. With these movement profiles, strong thrust, shear and torsion forces must be absorbed and removed without causing damage. For these areas of application we have developed various shifting prevention devices. Areas of application are both bound and unbound construction methods. 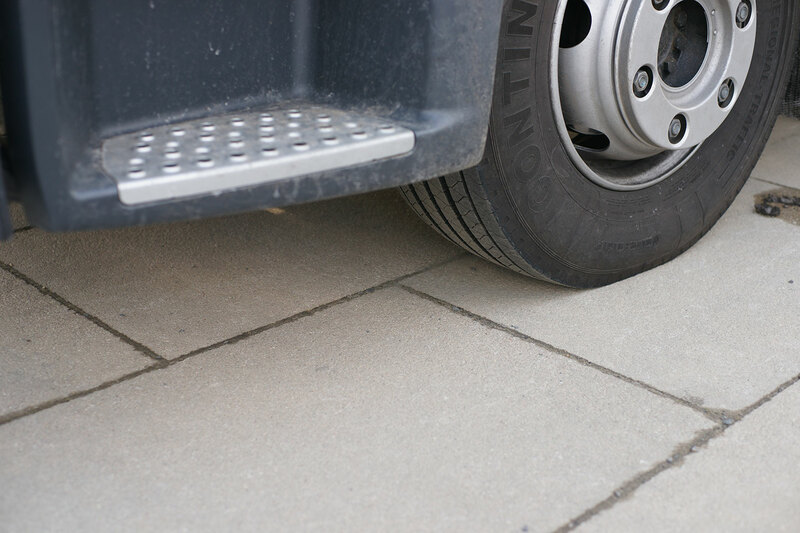 Large format slabs or paving made of concrete and natural stone must resist dynamic loads. According to the data sheet of the research company for road and traffic (FGSV), “state-of-the-art” shifting prevention devices should be positioned in hazardous areas.